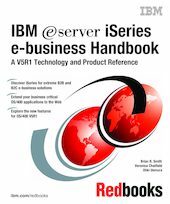 This IBM Redbooks publication -- a technology and product reference guide -- targets IBM marketing personnel, Business Partners, and AS/400e and iSeries customers who are looking to extend and expand their information server into e-business. It provides a bottom-up approach to learning about base OS/400 features and functions that provide a rock-solid foundation for e-business. Like adding a layer to an onion, it adds details about the networking aspects of e-business that are based primarily upon the TCP/IP protocol suite. The next layer describes the built-in Web serving features of both the original and powered by Apache HTTP servers. OS/400 is built for e-business. But the implementation e-business today does not stop at an HTTP server. It is the evolutionary movement of your presence on the Web from static Web pages, to dynamic data, and finally to a transactional site -- a business-to-business (B2B) or business-to-consumer (B2C) marketplace. To this end, we provide information to help you organize your understanding of some of the major e-business application environments available on your iSeries with V5R1 of OS/400. This includes the WebSphere Application Server, WebSphere Commerce Suite, Lotus Domino for iSeries, and Host Integration programming information for those who would rather extend an e-business environment themself. To round out this study of e-business on the iSeries, this book looks at sizing and performance, national language support, and systems management. It also serves as a fantastic reference for the myriad of Web sites, white papers, manuals, and other Redbooks that allow you to dive into greater detail once you have chosen the road down which you will take your business to e-business. For a V4R5 look at the same topics, see iSeries e-business Handbook: A Technology and Product Reference, SG24-5694.